According to researches, our national average usage of fertilizer is 58.6kg a year. The average usage for pesticide is 1.8kg, and other poisonous substances at 4kg. Hence, it is vital to find a way to flush out those toxins from the body. Barley Grass was reported to have miracle effects and is rich in chlorophyll, fiber, minerals, photochemical and enzymes that can improve body conditions and boost up the immune system. The SOD found in barley, can scavenge free radicals that cause damages to the cell and prevent chronic diseases like diabetes mellitus, cardiovascular disease and cancer. 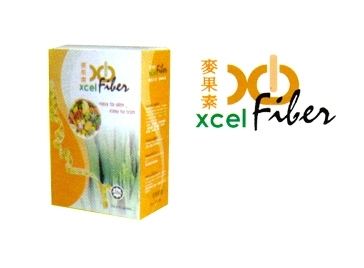 Xcel Fiber is a natural, high fiber yet low calorie delicious drink. It adjusts metabolism, enhances the burning of fat, removes toxic substances accumulated toxin from the body without affecting muscles. Barley Grass Powder, Pineapple Enzyme, Psyllium Husk, Apple Fiber, Wheat Fiber, Xanthan Gum, Fructose Oligosaccharide, Citric Acid Anhydrous, Fructose. Take 1-3 sachets with plain water daily. Mix 1 sachet XCEL FIBER in a glass of water (approx. 250ml), stir well and drink (tastes better with shaker use). The body needs at least 6gm of dietary bier delicious drink. It helps to remove toxins from intestines, to feel full and thus decrease the absorption of calories. (c) 2006-2009 Xcel World Trade Sdn Bhd . All rights reserved.